Aranjuez Cultural Landscape is a series of intermeshed water, garden, agricultural and constructed landscapes at a strategic royal location between Madrid and Toledo. It includes the Palace, the Island Garden, the Great Historic Garden, the urban area and the Prince's Garden. 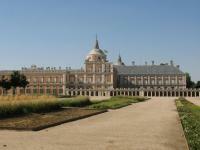 The Royal Palace of Aranjuez is a residence of the King of Spain. It was commissioned by Philip II in the 16th century as a private country palace. Juan Bautista de Toledo and Juan de Herrera, who also designed El Escorial, were the architects. Extensive waterworks were used to both irrigate and protect the moist soil, and turn this swamp into a Garden of Eden. The site was further enlarged during the reign of Ferdinand VI in the 18th century. A new, planned city and road system were built using geometric principles. Lines of trees are one of the most prominent characteristics of Aranjuez. Its huge gardens, built to relieve its royal residents from the dust and drought of the Spanish meseta using the waters of the adjacent Tagus and Jarama rivers, are Spain's most important of the Habsburg period. The AB evaluation of Aranjuez comes with a warning: we already have allowed 8 European Royal Palaces and their gardens on the List, this should be sufficient! The Spanish however were clever enough to propose this site as a Cultural Landscape, where the palace comes in as a side note. I found the nomination file very impressive; it does a good job in explaining the history of the manmade landscape, where the use of irrigation and dams has turned a swamp into a green oasis. It also emphasizes the importance of the parks for botany, as Philip II was an early collector of American and Asian tree species. Except for a minor round around Aranjuez town to look for a restaurant (where I landed at the recommended La Venta for a 10 EUR 3-course Menu del Dia), I limited my visit to the palace and its gardens. I started with a stroll through the Island Garden, which is decorated with many objects including a number of statues of ancient gods. This is also where the water works can be seen, these include dams, canals and bridges. 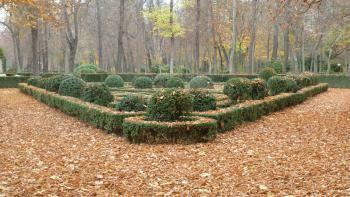 And it displays the tree-lined paths that characterize Aranjuez. Suddenly it started to rain a little, so I decided to check out the interior of the palace too. Whenever I visit palaces these days, Ian Cade's quote "palaces bore me rigid" directly comes to my mind. And yes, I too have shuffled from one boring room to the other in many palaces around the world. But I had some good experiences too lately, for example in Fontainebleau. I was lucky again now, as I was about the only visitor around. I paid for the audioguide, where the talks were informative and not too long. The number of rooms that it includes also is not too overwhelming. Among them are 3 that really stand out: the yellow rococo Grand Dining Hall, the Arabian Room and the unbelievable Porcelain Room where porcelain objects have been nailed into all walls. On my final morning in Aranjuez I visited the biggest garden, the Prince's Garden. This felt much more like a city park to me. It is very large, and is used by joggers and local elderly going for a walk. Its strongest point is the high number of different tree species. It has less ornamentation than the Island Garden. The park ends at the Casa del Labrador, a small neoclassical palace which is also used by the Spanish royals. Previous reviews left me not expecting much from Aranjuez. However, when the sky is perfectly blue, the gardens are a lush green, and my only alternative was to join my wife shopping? Aranjuez turned out to be a delightful couple hours! Originally, I did not even include this WHS in my itinerary, since Segovia and El Escorial were my primary focus. Nevertheless, the train was simple, affordable, and the weather was superb (though hot). I spent most of my time exploring the gardens, which really are quite extensive. There are so many small treasures to be found, from playful fountains, to an aviary, and even a "Chinese" pond. Overall, I am pleased I made the trip. The cultural landscape pull of this world heritage site makes it unique enough. To summarize, the water landscape (rivers, ponds, dams, ditches), the agricultural landscape (orchards and nurseries, stock-breeding farms, meadows), and the landscape for leisure (ornamental gardens) all make up a rich component to Aranjuez that is best appreciated in beautiful weather. My expectations for Aranjuez were not too high - another royal palace close to a big capital -, but it's very easy to reach by commuter rail from Madrid, and the palace was actually quite interesting and well-presented (especially the Porcelain Room). I then went for a walk through the surorunding parks along the Tejo River, which feature many different fountains. It was an enjoyable half-day excursion, but as mentioned in other reviews, the site does not add a lot of new value to the WH list, as evidenced by the fact that Spain had to use the trick/work-around with the cultural landscape to get this site inscribed. I visited this WHS in June 2015. This is one of many other WHS made up of gardens and palaces and it certainly isn't one of Europe's best. It's location helps it a great deal as it is a pleasant half day trip from Madrid or Toledo. However, I very much prefered the Escurial's interior although much more crowded. The highlights of my visit were the Island Garden and the Prince's Garden. That said, I felt that they offered no real OUV but more of a pleasant rest in the shade in what should be considered more of a national heritage site. Strapping on my camera and backpack I did my duty and after a short hop on the commuter train from Madrid I landed at yet another European Royal Palace complex. First stop the palace; fortunately I was able to whizz around in about 20 minutes. There are so many palaces like this on the list it is tough to find things that differentiate them, fortunately the interior here was so ghastly it left an impression. The Arabian Room did a fantastic job of mimicking the heights of mudejar design and then ruining it by colouring them in like an 8 year old and the Porcelain room was so horrifically over the top you couldn’t help but be impressed. The whole time I was walking around I kept on being reminded of the taste of Hyacinth Bucket (sorry that may be a slightly niche reference). Happy to escape the interior I ventured to the gardens, and I must admit I was pretty impressed. The Island Garden was actually a really pleasant place to wander around. The carpet of autumn leaves did add to the joy of strolling around, crunching from one little fountain to the next. In fact I would say it was one of the nicest palace gardens I have been to. The advisory body report states that the historic centre of the town may “well have been considered for World Heritage status in its own right”. I think that is a little generous, I would probably award it the accolade of “third most interesting terminus of Madrid’s commuter trains (of those that I have so far visited, of which there are currently 3)”. It was pleasant enough but rather lacking in life, though I did enjoy watching two priests play football on one of the squares. Despite my slightly disparaging remarks Aranjuez was actually a nice break from Madrid, the regular trains made it an easy hop from the tapas bars and galleries of the Spanish capital and the planned gardens were actually some of the nicest I have visited. 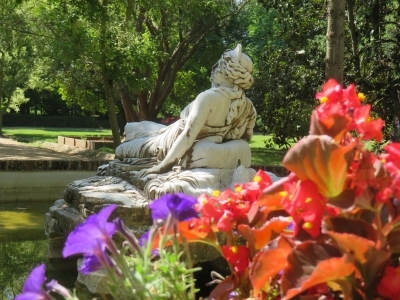 I would put it as the lowest priority of all the sites around Madrid, though if you want a quiet half day strolling around some lovely gardens then join the madrileños in heading to Aranjuez. 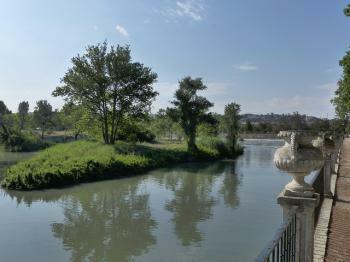 If you already heard Rodrigo´s "Concierto de Aranjuez" you must visit this little city in Central Spain. That is a very charming place and deserved the honour of inspiring Rodrigo´s genius. Aranjuez is a place for dreamming. 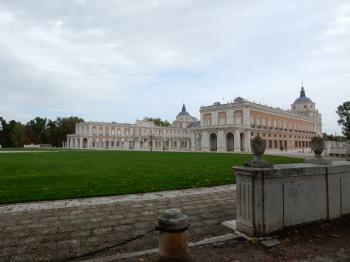 I visited the royal palace at Aranjuez on my first day in Spain after an overnight flight from Montreal to Madrid. It was my first WHS in Europe. The train ride from Madrid to Aranjuez was less than an hour and it makes a perfect half-day trip from Madrid. The palace has many rooms; the one that stands out the most in my memory is the Alhambra-inspired one. Unfortunately, no photos are allowed inside. However, they are allowed at the gorgeous garden nearby. The palace is no comparison to similar sites I visited later on my trip such as El Escorial but it's worth an afternoon nonetheless. I would suggest visiting this site first before the other WHS near Madrid in order to evade disappointment. Ideal City: The city of Aranjuez was developed as an Enlightened City from 1750 on, with strict geometry. 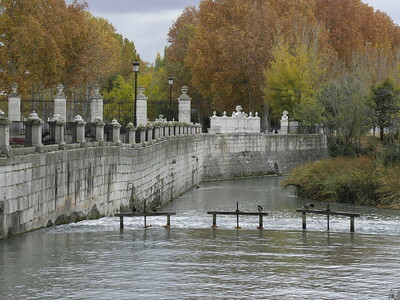 Built in the 16th century: "The most important general factor which makes Aranjuez and its landscape distinctive and a strong candidate for World Heritage status is the way in which it has been shaped and developed by the interests of the Kings and Queens of Spain and their Courts between the early 16th and mid-19th centuries." 177 Community Members have visited.